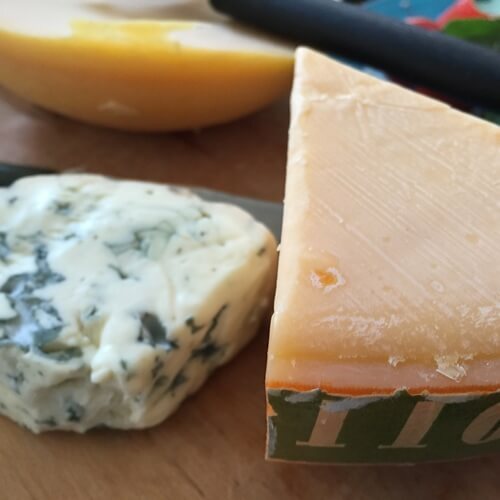 Writer G.K. Chesterton once said, “Poets have been mysteriously silent on the subject of cheese.” It’s an idea worth reflecting on, given that Americans have a love affair with cheese befitting some epic Shakespearean sonnet. According to a report by the Center for Science in the Public Interest, the average American eats 23 pounds of cheese per year, nearly triple the same figures from 1970. Whether good or bad, it’s clear that cheese has irrevocably permeated our culture. Still, there’s more out the than beloved staples like cheddar, mozzarella, provolone and gouda. Here is a guide to more exotic cheeses equally perfect for a new recipe or for adorning a party platter. This cheese hails from the Greek island of Cyprus, and has found popularity with dairy farmers across both the United States and Canada. Noted for its firm texture and extra salty flavoring, halloumi is often compared to feta cheese, though it’s a bit firmer. Halloumi is traditionally never eaten alone, as its best used to enhance other dishes. Use the cheese in place of mozzarella on pizza or a caprese salad, or try the traditional Cyprian recipe and pair it with watermelon slices. This French variety is often called the “King of Cheeses,” and was instead a favorite of Charlemagne. It calls for or a certain sense of adventure when consuming, as the cheese is made by adding penicillium roqueforti spores, an actual fungus, to the curds. Still, it’s those spores that give roquefort its rich and creamy flavors, which, depending upon the cheese’s age, can range from sweet and savory to smoky and salty. Roquefort is used commonly in pasta dishes, but is also enjoyed as a dip or with steak or chicken. Made from the milk of cows in the mountains surrounding Belluno, Italy, piave cheese – also called piave vecchio – is heralded for its similarities to parmigiano. In fact, to many rookie cheese connoisseurs, piave is only lacking the distinct granularity of parmigiano. Yet, the actual taste is described as similar to parmesan and gouda, a mix of sweet and smoky flavors that’s exceptionally creamy. As such, it’s a great substitute for lighter summer recipes, namely pasta dishes, especially ravioli, and various salads. This cheese is often suggested as a nice alternative to mozzarella and ricotta. However, burrata cheese is far creamier and richer than its counterparts; it’s no surprise, then, that its name actually means “buttered” in Italian. Mozzarella and burrata may use similar ingredients – namely buffalo milk – but burrata is created differently to emphasize a denser outer shell and a gooier interior. Burrata is used in many of the same recipes as mozzarella, especially pizza and ravioli, but is also featured as a dessert with berries and honey.